Clearing the Air tells the full story of what's happened to the air we breathe. Sustainability journalist Tim Smedley explains exactly what air pollution is, which chemicals are the dangerous ones and where they come from. He interviews the scientists and politicians at the forefront of air pollution research as well as those whose lives have been affected by smog. 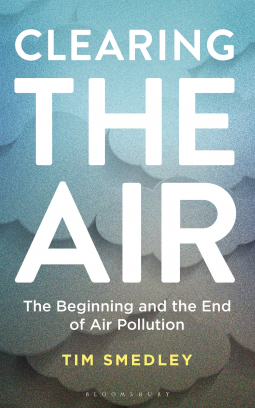 This groundbreaking book reveals the extreme instances of air pollution that have happened around the world, including London, Beijing, Delhi and LA, as well as examining recent stories like the VW diesel scandal. Globally, 18,000 people die each day from air pollution. For the most part, air pollution is anonymous; an invisible killer borne from the cars in our driveways and the industrial processes used to make stuff, but there is so much we don't know. Parents on the school run in their 4x4s have never been told that the pollution inside the car is 5 times worse than that on the street outside, or that studies show how air pollution stunts lung growth in children. Around the world, more than eight-out-of-ten people who live in cities breathe in concentrations of air pollutants that exceed international air quality guidelines. The annual number of deaths--6.5 million--is far greater than those from HIV/AIDS, tuberculosis, malaria and car crashes combined, and it is getting worse. These problems can be solved, and the message of the book is positive. The overwhelming majority of air pollutants are local, short-lived, and can be stopped at source; the benefits to health, instant and dramatic. There are many stories that show how the fightback against air pollution can and does work, and we can all play a part to clear our air.